With Raincheck Tickets on Hand you will be prepared for whatever Mother Nature throws at your event. Be Prepared for the sad day when your event must be cancelled due to weather? Need to re-schedule it due to an unforeseen circumstance? No problem, we've got you covered. 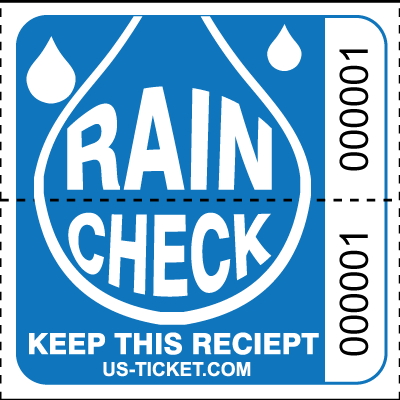 Use out Rain Check Roll Tickets to allow your guests easy re-entry when the event starts up again. Each 2 part ticket has matching numbers with a date portion for you to validate. The guest keeps the ticket to allow them re-entry to your event or venue. Printed on bright Heavy Weight Ticket Stock, 1000 tickets per roll. Of course just like everything else we print - these can modified any way you like to make them unique just for you.